For approximately 100 years, from the 1870s to the 1970s, US Presidents often feted various dignitaries or conducted diplomacy from the cabins of government owned yachts. 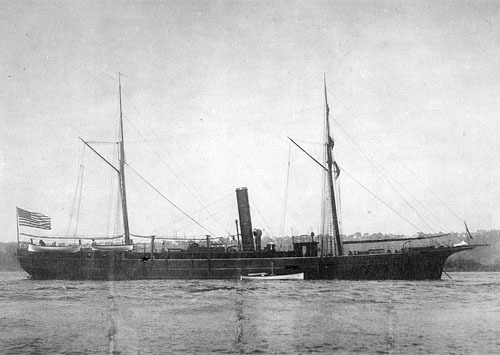 The first of these, USS Despatch, was launched in November 1873 as a wooden hulled steamship. Acquired in 1880, the 174 foot ship first hosted President Rutherford B. Hayes on a cruise of the Potomac on November 9, 1880. The vessel went on to serve dutifully as a refuge and office for Presidents Garfield, Arthur, Cleveland and Harrison. On the night of October 10, 1891, the Despatch was en route from New York City to Washington to pick up President Harrison and Secretary of the Navy Benjamin Tracy for an inspection of the naval proving grounds on the Potomac. Unfortunately for the American taxpayer, the vessel ran aground in the shoals off Assateague, Virginia. The ship’s lieutenant confessed to having mistaken the Assateague lighthouse’s orange light for the red light of the Winter Quarter Shoals lightship – a 1.5 mile difference that cost the vessel her life. The entirety of the crew were able to safely make it ashore, however, the Despatch was a complete wreck and was lost to the shifting sands off Assateague. In 1997, explorer Ben Benson mistakenly believed he had discovered the Despatch in 22 feet of water, however, he was incorrect and the vessel remains undiscovered.